Amazon's ambitions to build a fleet of self-flying delivery drones will have an interesting side-effect: They will create unimaginable quantities of data. Aerial footage, mapping data, flight patterns, number-crunching analysis, and more -- autonomous vehicles produce vast reams of data, and drones are no different. And Amazon is already thinking about how it can turn that to its advantage. In a filing for a patent granted on Tuesday, the Seattle-based online retail giant lays out how "captured data may be received by a computer system and properties about a destination for the delivery may be identified by analyzing the data. A recommendation may be generated based at least in part on the identified properties." In plain English? Amazon's drones could analyse customers' homes as they make deliveries, and then try and sell them products and services based on what they "see." "For example, the one or more service provider computers may analyze the data and identify that the roof of the location is in disrepair and in need of service. Subsequently, the one or more service provider computers may generate and provide a recommendation to the customer informing them of the identified property and offering an item or service that is appropriate for the identified property (e.g., a roof repair service recommendation)." "The unmanned aerial vehicle may capture video data that includes brown and dying trees located near the user's home. The service provider computers may utilize image and/or video recognition techniques and software to identify that the trees require service (e.g., services that can be provided by an arborist). The service provider computers may, in response to identifying that the trees near the user's home are dying, generate and provide a recommendation to the user that includes information about arborist services or items such as fertilizers that can help the user's trees." These recommendations -- or adverts, depending on how you look at them -- could be delivered by email, text message, or a notification on Amazon, the patent suggests. 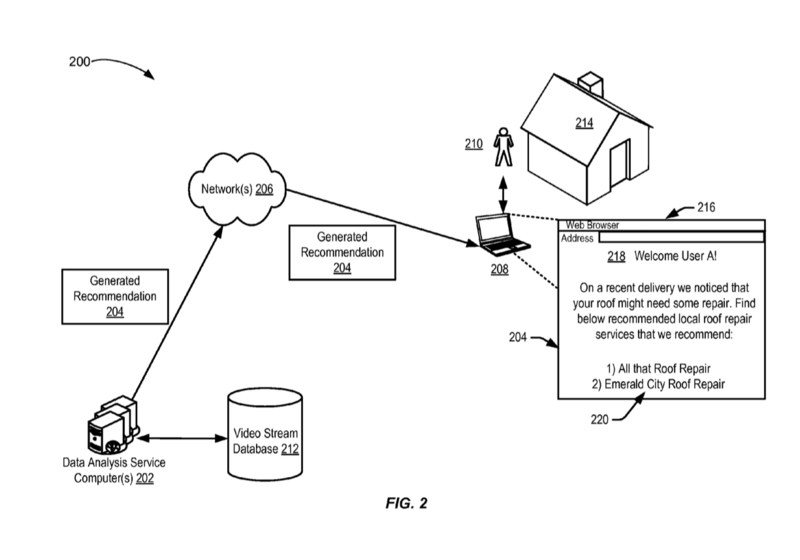 There are clear privacy concerns about Amazon analysing your backyard for potential retail opportunities -- though the patent suggests it would be opt-in, and only capture and analyse this data with the consent of the customer. "It may capture data such as video data or audio data as requested by the property owner associated with the delivery location," it says. Amazon's plans for drone deliveries are still a long way from commercial reality. It is testing the tech in the UK, and has conducted some very early trials, but it will be years until ordinary people can order a product and get it delivered by drone. But the patent serves as a reminder that convenience sometimes comes at the expense of privacy, and drone-powered future may offer unprecedented opportunities for surveillance.